More often than not, it’s considered a loss every time a skilled yet unhappy employee decides to leave the company for any reason. It takes time and resources to find a replacement, which creates a temporary void that needs to be filled and may affect the whole operations of a business. 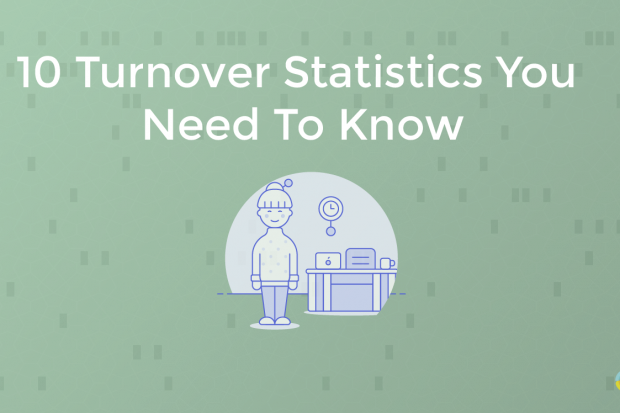 As a responsible business owner, manager, HR professional, or recruitment agency, you must know the reasons behind high turnover rates so you can mitigate the situation. You wouldn’t want to be that company with that kind of reputation. Potential applicants (and your competitors) may even think there’s something wrong with how you run things. 80% of employees leave due to bad hiring decisions. It takes up to two years for a new hire to match the productivity of a tenured employee. According to a survey, 31% of 1,000 employees quit in their first six months for different but avoidable reasons. Companies that support flexible hours and remote working conditions have a 25% lower employee turnover rate. 65% of employees believe they can find a position offering a higher pay, which gives them more confidence to leave their jobs without fear. Over 50% of global companies have a difficult time addressing employee retention. For more than two years, 10-20% of an employee’s salary goes to training. 50% of employees voluntarily leave in the first two years of employment. Management transparency generates 30% better retention rates. 46% of HR managers believe that employee burnout is the reason for half the company’s workforce turnover per year. How Would a High Turnover Rate Affect Your Business? A high employee turnover rate will have adverse effects in many areas of your business. When one leaves, the remaining team members are likely going to pick up the slack. This could lead to overtime requests and some delays in their deliverables. Ultimately, this would incur more costs for the company. If employees are aware that their co-workers are leaving, this may also affect the overall morale of the workplace, prompting others to question their loyalty to the company and think of finding better opportunities elsewhere. The stress caused by a high turnover rate may lead to lowered productivity in the remaining teams, which can cause more complications in the work environment. Being overworked to compensate for the absence of the former employees would likely affect their health, leading to absenteeism that may cause detrimental effects in task delegation. All these factors could create a domino effect and cause more employees to leave, so you’ll have to implement quick and efficient recruitment processes that would help avoid creating unpleasant drama that adds stress to the workplace. Always keep in mind that your workforce is your company’s most valuable asset. If only all your valued employees would never leave the company, it’s going to be easier to steer your company to success. However, this only happens in a perfect world, so there will be those who will leave to search for better opportunities that will be good for their career growth. This is a guest post by Melanie Alvarez. Mel Alvarez provides fast, convenient advice to high-growth, innovative teams with specialized recruitment requirements in the Philippines. She also connects top-level candidates to Manila Recruitment’s placement services, through social media and digital channels. As a leading member of the client services team at Manila Recruitment, Mel is passionate about helping clients solve their executive, expert and technical recruitment needs in Manila’s dynamic job market. In today’s competitive talent market, finding creative ways to recruit candidates online is more important than ever. Everything around the employee experience is now being streamlined by digital methods and tools, which means that the recruitment process has also evolved. It’s true that candidates today are plugged in, and savvy employers know that recruiting candidates online will get them the best exposure and ultimately bring more talent through the doors. But you may be wondering: How can employers go about recruiting candidates online in the most effective way? How can they rise above the noise? Luckily, there are a number of creative ways to recruit candidates for your company — so to save you time, we’ve compiled these ten tips to help you find and recruit employees online. Follow these steps and you’ll be well on your way to securing more job applications (you’ll be swimming in them)! 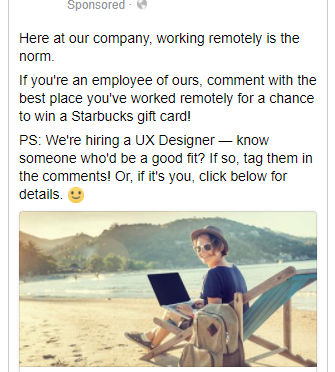 One idea is to run a creative, interactive ad campaign on Facebook targeting both employees AND talent/potential applicants. The trick here is to include one perk/benefit/mission that makes your company unique. That benefit will be the main focus of the ad. In the ad itself, make sure you include a link to the jobs page of your website so that all clicks are routed to the application page. You can even offer existing employees the chance to win a gift card for interacting with the campaign. Why involve current employees in the campaign, you ask? By encouraging interested employees to comment and become a part of the discussion, their friends will see testimonials and notice that you’re hiring. Plus, you’ll get extra views and maximum exposure because the friends of your employees will also be able to see the post as they interact. Of course, you may be wondering: How should I go about creating Facebook recruitment ads that specifically target the right audience? How can I be sure it gets in front of the right people? First, in your Ad Set, you’ll edit the settings so that it targets current employees of your company as part of the audience. You can do this in the Ad Set by selecting Demographics -> Work -> Employers -> Your Company to type in the name of your company. Next, we’ll want to also make sure that the ad is seen by non-employees — and we only want to target non-employees that specifically have the skills we’re looking for. So let’s say you’re looking for a UX designer. As you’re creating the Facebook ad campaign and filling in the Ad Set details, select the type of experience you’re looking for in the form of job titles, interests, or education. And don’t worry, you can list as many job titles or interests as you want (but the more specific you are, the better)! In the above example, this would mean that both existing employees AND anyone who has worked as a UX Designer would see the Facebook ad. This is exactly what we want. This way, you can start a campaign that involves both your employees and potential recruits (and your ad will get way more engagement). We all know that promoting open job listings on your own website is always a good idea, but how do you reach out to other audiences for additional exposure (especially if you’re on a tight budget)? The good news is that it’s very possible. If you’re looking for a way to reach even more potential candidates without spending a dime, you can start by guest posting on other relevant blogs and linking back to your company’s career page. -Find a relevant website that targets your ideal candidate. See if they publish guest posts (they might have a link to a page for contributors, or you can browse some of the authors on their blog to see if there are any bloggers from outside of their company). You could also try a Google search along these lines: “Company-name-here guest blogger” and see what comes up. -Once you’ve verified that they do indeed accept guest posts, brainstorm a few article ideas that could work for their blog. For example, you could write an article about unconventional employee perks or a piece about company culture where you offer up a few examples from your own company. Make sure the article findffers value to their readers while also highlighting what makes your business unique. -At the end of (or somewhere within) the article, add a blurb saying that you’re hiring. Include a link to your company jobs page where they can find open positions. -Send the article to the blog’s editor for review. 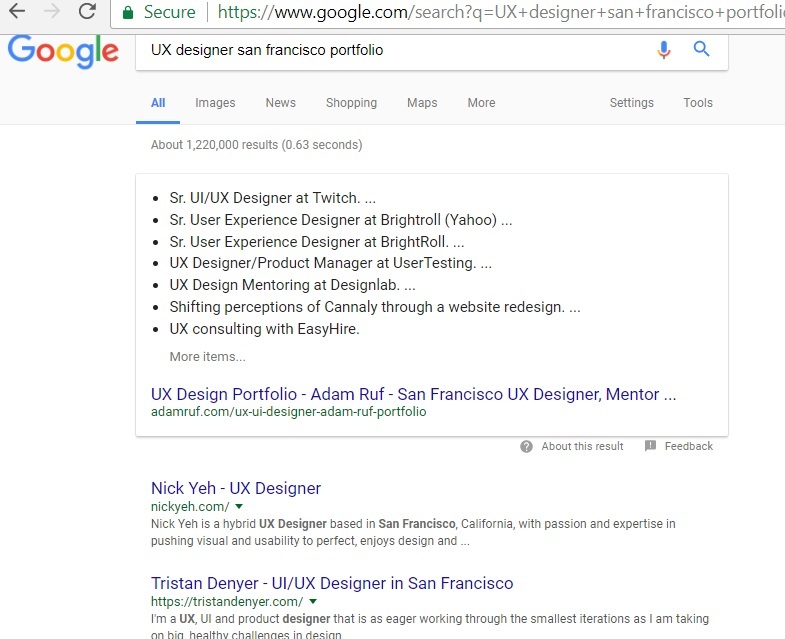 You can likely search for the editor’s name, or browse LinkedIn and a tool like Email Hunter or Find That Email to figure out who to contact. Be sure to follow up if you don’t hear back. If you don’t hear back from them within two weeks or so, you can always contact another blog editor from a separate website. -Help promote the article once it’s published. After that, sit back and watch the applications roll in! If the website you’ve chosen gets a decent amount of traffic, chances are, you’ll see a fair amount of new applications come in over the next few weeks. Does your company offer email support or general assistance? If so, ask your staff to add a blurb to the bottom of their email signatures with a link to your job listings. Want to track the results? You can easily track link clicks by using a bit.ly link (you can register for free). Then whenever you sign in to your account, you’ll see a dashboard with the number of clicks your link has received. This can be pretty useful, especially if you enjoy analytics! Remember to give it some time before expecting to see results from your signature. One day isn’t enough. Traffic from email signatures can take days or even weeks to make a visible impact, depending on the number of emails you receive and respond to. This email signature trick takes almost no time at all — this tactic is so effortless that you could implement it as soon as today! If you have a blog list of loyal email subscribers who’ve opted in to receive news and updates from your company, why not send them a quick message about your open positions? The trick here is to keep the message short and sweet. This is also a great time for your HR & marketing teams to work together to craft an amazing message (or, if you’re still growing and don’t have a marketing team yet, you may consider contracting out a copywriter to help you write the perfect email copy). The email itself should highlight the benefits of working at your company, along with a link with more information on how to apply. The most difficult part will be getting people to click on the link — you’ll need to list persuasive reasons why working for your company is great (something that will actually prompt them to take action). 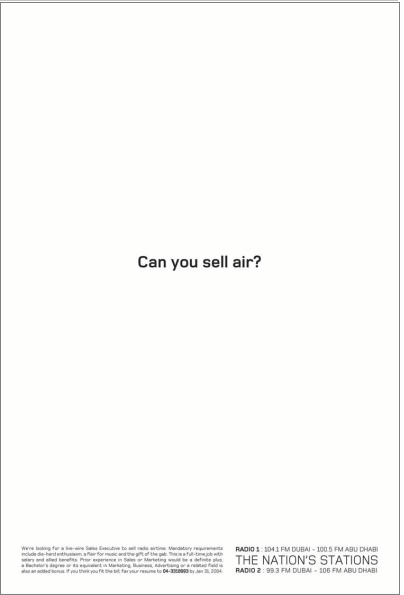 That’s where the copywriter comes in! After you’ve sent out the email, you can re-use the copy on your company’s job page or other recruitment materials. And the best part? Many of these individuals have “Contact” pages on their portfolio websites with different ways to get in touch. The key is to reach out to them with a super personalized message highlighting something you found interesting about their work accomplishments or portfolio. This will let them know that you’re not just sending out email blasts to everyone and that you are, in fact, messaging them individually (because you are!). Now this part is where many employers drop the ball: If the person is already employed, don’t let that deter you. Just focus on starting a conversation and see where it goes. Who knows, you might find that they’re looking for a change. However, if they’re not looking for a career change, be sure to stay in touch because there’s always the chance that they could change their mind in the future. It’s all about persistence. There are many powerful job boards out there like Glassdoor and Indeed that will help you get your job listing in front of a large audience. In addition to providing free listings, they also have premium options that can help you get even more views if you’re looking for a boost. If you utilize HR software at your company, there’s a chance it may already integrate with these job boards out of the box. It’s not just HR that should be sharing your company’s jobs. When you get the whole company involved, magic happens. Since the most successful hires tend to come from employee referrals, why not ask your staff to share your open jobs with their networks? You can email them links that make it easy to share (see below), or make a company-wide announcement. Participating could be as simple as an employee sharing a post about open job listings on LinkedIn, or re-tweeting a “we’re hiring” message on Twitter. To make it even easier for your employees to share news about new roles opening up at your company, consider messaging your employees with a pre-populated link to a tweet. If they decide to click on it, a tweet will automatically pre-populate with the information you provided (making it ridiculously easy for them to share — they just have to press one button). Check out the below example to see the formula for this pre-populated tweet (feel free to replace the existing text with your own, then add it to your address bar to test it out). The easier you make it for employees to spread the word, the more shares your job listings will produce (and the more employee referrals you’ll see). Think about the last time you bought something on Amazon. What steps did you take before you purchased the item? Chances are, you took a peek at the reviews before buying — so why wouldn’t potential candidates do the same? The truth is that candidates regularly do their own due diligence when applying for jobs. It’s not a matter of if, it’s a matter of when. So, embrace this trend by encouraging employees to leave honest reviews of your company online. 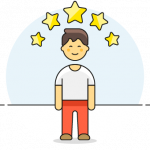 Sites like Glassdoor have sections specifically for employee reviews. The key here is to ask for honest, authentic reviews. When leaving reviews, employees can remain anonymous, and you want to ask them to be upfront because you’re looking for the best possible match. Encourage your employees not to hold back in their reviews. Well, let’s say your company culture is fast-paced and intense. This could be seen as negative to some, but positive to others. In all reality, an employee leaving a brutally honest review can be a powerful thing. It will help ensure you’re attracting candidates that are seeking out the same type of atmosphere (and those who aren’t a good fit won’t bother applying). Think about where your ideal candidate might go online to learn and chat about their profession. Check out those websites and if you find someone you’re impressed by, you can always message them to gauge their interest in your open positions. If your ideal candidate doesn’t fit in to any of these categories, you can always try Quora. On Quora, people share knowledge about a wide range of topics and professions on a regular basis. Remember that before engaging with any community, it’s important to look around and explore the community for a bit so that you can get an idea of how it works and don’t burn any bridges (nobody wants to be the crazy imposter!). Of course, we couldn’t wrap up this article without mentioning LinkedIn. Aside from publishing your jobs on LinkedIn, it’s also wise to browse the site for 2nd-degree connections (who knows, some of those connections may end up being your next rockstar hire!). If you find a 2nd-degree connection that looks promising, reach out to your mutual contact and ask for an introduction. Warm introductions will ultimately get you much further than cold messages. Better yet, you may find that some of your current employees have talented connections! Now it’s Your Turn to Make it Happen. Have you tried any new recruiting tactics as of late? We’d love to hear from you — share your experiences in the comments below! Nothing is worse than being wrong about a new hire and realizing that you hired the wrong person. It costs time, money, and brings down the whole team. Or maybe you made a great hire, only to realize that it was more difficult than you thought to repeat and find other A-players. But you know what’s also pretty frustrating? Not knowing what went wrong in the decision-making process leading up to the hire. The best managers have processes in place and know that hiring isn’t just a game of chance. Although there is always some element of randomness, people who have been hiring top talent for years have specific processes in place to assist them in making quality hires consistently. Even despite these processes, HR managers and recruiters also know that there is no silver bullet and that even the sharpest hiring managers can make hiring mistakes. The truth is that even though there is not a magical way to make sure 100% of your new hires are great. However, having solid practices in place will help significantly increase your chances of hiring an A-player. After all, it’s all about building a repeatable hiring process that will help you win top talent again and again. Savvy recruiters know that consistency is key when it comes to hiring A-players, which is why resources that promote consistency, like interview scorecards, are on the rise. Carlie Smith, Head of Talent at OpenView Venture Partners, says that interview scorecards help hiring managers make more quantitative decisions so that they can successfully avoid relying solely on gut feelings. 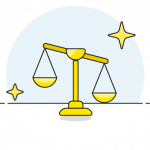 With applicant scorecards, you can define a set evaluation criteria and provide a rating on a scale of 1-5 with a place for notes. Let’s dive right in. 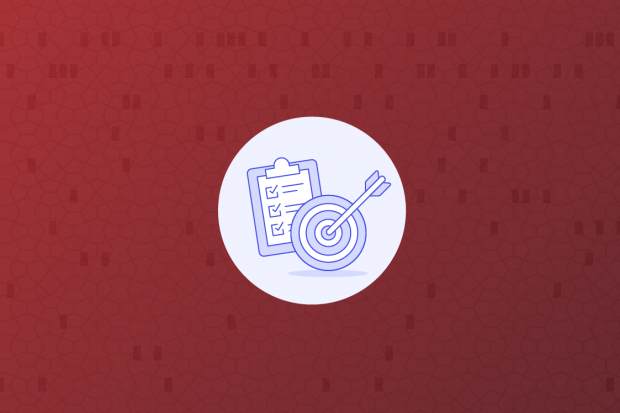 In this article, you will learn the top reasons why scorecards can help give your hiring process consistency and structure (so that you can hire more A-players). 1. Interview scorecards help promote unbiased decision-making. Let’s face it: We all have days when we’re not feeling our best — we’re only human, after all. Therefore, it’s important to find a way to make sure that those “off” days don’t impact our hiring decisions. If you are able to acknowledge that people can be biased (and make an effort to avoid emotional decisions in your hiring), you’re already ten steps ahead. 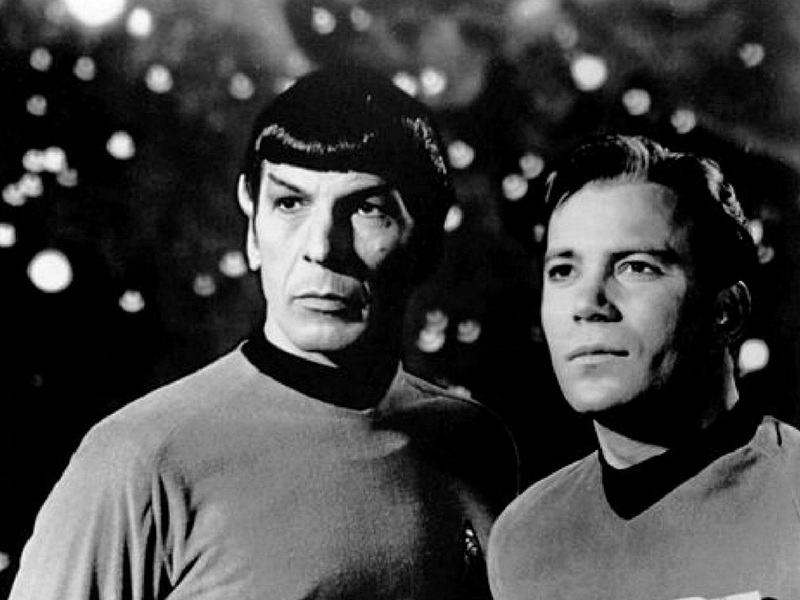 Unless your name is Spock, chances are you’re probably not 100% immune to making emotional decisions. For example, a hiring manager may feel more excited about one candidate over another even though they have the same qualifications. Or take this real-life example: According to one eye-opening study, judges were more lenient in their rulings in the beginning of the day and directly after their lunch breaks. So, now that we know humans aren’t immune to making biased decisions, what can we do to avoid it? Well, it all starts with keeping accurate records of your processes. Maintaining an interview scorecard to evaluate job applicants is one of the simplest ways to help you keep track of the required skills and desired qualities in a role — and since every candidate is evaluated based on the same set of criteria, it helps you stay unbiased and quantitative. As Ben Dattner of the Harvard Business Review points out, humans can be biased and emotional when hiring. The best thing you can do is acknowledge this and take the necessary steps to prevent emotional decisions from happening in your company by putting the right processes in place. For example, you may look at your team’s scorecard review of two different candidates, only to find that the candidate you originally preferred actually met fewer requirements. After reviewing the scorecards, you might re-evaluate and perform another round of interviews. 2. Scorecards help keep your whole team consistent when making hiring decisions. Candidate scorecards are a great way to keep yourself honest about what matters most for any given role. It also helps keep you and your team on the same page at all times. 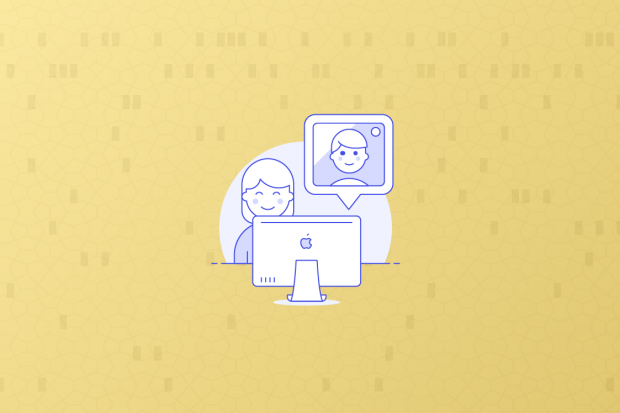 Evaluating candidates in this way will help your team think through their candidate preferences and get super, super specific about their feedback throughout the hiring process. Rather than a colleague saying, “This candidate is the best so far,” without any further explanation, they will instead be encouraged to back their opinion up with specific details supporting their case. With hundreds of applications and weeks (or months) of interviews, it’s more important than ever to collect your team’s feedback and to keep it all in one place. That way, all of the decision-makers can weigh in and go back and review each candidate’s qualifications to ensure that those who are qualified are quickly moved up the hiring pipeline without getting lost in the shuffle. 3. They help you find A-players by building a repeatable process. Have you ever wished you could clone a top performer at your company? The best way to make another successful hire is to look at the qualities of your top performers and find commonalities — then hire for those traits when relevant. Creating a list of desired qualities for every role in your company means that you will be able to build a repeatable, scalable process that will help you identify top talent for years to come. Let’s say you made a great hire earlier this year and you’re now looking to hire more A-players. Since your last hire ended up working out and being a top performer, then surely your next hire will be just as great, right? The answer is maybe, and your chances are much lower if you don’t have a process in place. Let’s consider this: How much better would you feel if you had reassurance that the same winning process could be repeated? The key to this is keeping records, creating lists of desired qualifications, rating candidates based on these qualifications, and making notes throughout the interview process in order to stay consistent. After all, how can something great be repeated if there are no documented processes in place? 4. Scorecards can help prove that you’re complying with employment law. If you ever need to support or defend your hiring decisions, having records of the system you use to evaluate candidates fairly can sometimes help your case. This will help you prove that you evaluate all candidates for the same set of requirements. The more records you have of what went into your hiring process (or why you made a hiring decision), the better — even if only for peace of mind. Even if you don’t need those records now, there’s always a chance you will need them in the future. 5. Scorecards will help you avoid guesswork & stay organized when hiring. Even though the hiring process can be chaotic at times, candidate scorecards can help you bring everything together and make sense of it all. Rather than having to rely solely on memory (I’m pretty sure we all have enough to remember as is! 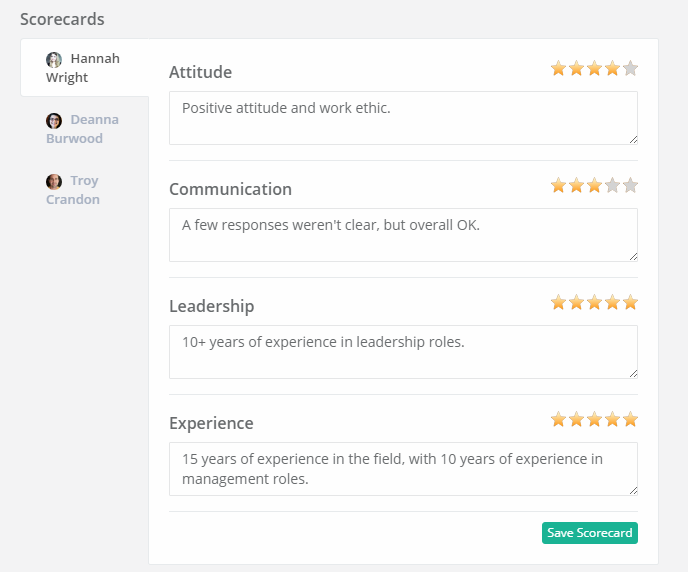 ), scorecards will help you keep your candidate evaluations consistent and easy to find later. In turn, this helps you compare applications fairly, identify common themes, and increase the rate of successful hires for your company. One bad hire can cause significant damage to a company’s morale, while one awesome hire can make a big impact for the better. 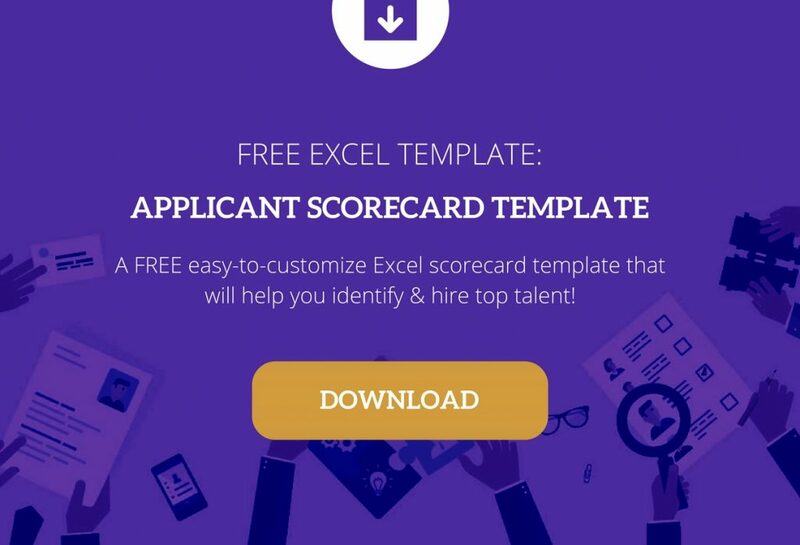 Using scorecards throughout your hiring process will help you identify those winners and hire even more of them! Are you looking for an interview scorecard template? Grab your free download below. Your company is top notch and you’re looking for top notch employees. A new position just opened up and you need to fill it soon. You know that this position would be perfect for the right person, and the benefits are competitive. So you create a job description, publish the listing, and wait. The applications start to roll in, but there’s one big problem: None of the applications have fulfilled the requirements listed, and even worse, it appears that many of the candidates didn’t even read the job description! If you’re not getting high quality applicants, it may be a sign that it’s time to write a brand new job description. With these tips, you’ll find out how to give your job listing an edge so that you can attract the best applicants around. Visit the website where you plan to post the job. Browse a few of the other job listings and check out your competition. Doing this will help you write a job description with your audience in mind. Studies show that an overwhelming number of job seekers – as much as 45% – use their mobile phones to search for job openings. This tells us that there are a growing number of non-readers, skimmers, and browsers in the workforce. The result from analysis done on the current labor market says that Generation Z is entering the job market seeking experiences and are more receptive to visuals than text. The recruitment industry and forward-thinking HR professionals should be aware of this when crafting effective job posts. Find that fine line between interesting and weird. Start by omitting the company history – the interested applicants can (and should) be able to find this information with just a few taps of their keyboard. Instead, use that space for a winning description. The listing should be divided into clearly labeled sections: Job responsibilities, ideal qualifications, what the company offers, and the application process. Believe me, overused descriptions like this will make your readers yawn. Instead of saying that your company is looking for candidates who are “passionate” and “results-driven,” provide examples of what success means for the specific role. The more examples you can provide, the better. Although similar, a job listing and a job description are about as different as product advertisements and product user manuals! Think of the job listing as the sales call; you’re trying to get the best applicants to click the “Apply” button. The job description, on the other hand, is an internal document – its purpose is to clarify the role. Of course, you don’t want to write a novel, but you don’t want a one-liner either. It can be challenging to balance brevity and detail (trust me, I know). To make things easier, work with the hiring manager to understand more about their specific requirements. Be honest about what the job entails – if the job involves working late hours or dealing with angry customers, be upfront and say so. Find the positive in the negative and present a fair trade-off. For example, Peace Corp ran a recruitment campaign in 1961 and said that the right candidates must have a “strong stomach,” but that the work would be really great for the world. Candidates want to know the harsh details upfront so that they don’t waste time. Since the job listing is essentially a sales pitch for your vacancy, the pitching starts with the title or tagline. But how do you craft a tagline that’s attention-grabbing? Consider leading with an interesting fact in the title, then creatively direct their attention to the recruitment portion of the listing. The above example is an eye-grabbing tagline used in an old recruiting ad by The Nation’s Stations. Just imagine that your title is the subject line of a marketing email – it is designed to inspire the reader to click on the message and read more. In this particular section of your job listing, it’s important to put your best foot forward (without sounding arrogant). We have all seen that job listing that says “Our company is the best and largest in its industry” and, of course, they make it sound like people line up for the chance to interview with them. OK, while they may not say this word-for-word, that’s how some of them come across – and at least to me, it can be off-putting. If a company sounds too good to be true in the job listing, then this will generally only attract unrealistic, gullible, non-performing candidates. Okay, so you have grabbed the readers’ attention with your catchy title and convinced them that they want to work at your company. Now they have to see whether or not they are capable of the job tasks – both physically and mentally. This is where you clearly distinguish between the “must-haves” and “nice-to-haves” by stating which skills, work experience, education, or certifications a candidate must have to apply for the job (and which ones will win them bonus points). This is also where the applicant figures out if this role is right for them. Whatever you do, try your best to avoid using company jargon or technical terms that aren’t widely known or you could lose some good applicants. If you’re not sure whether you have included industry lingo, ask a friend working in the industry you are recruiting for to look it over and give you their feedback. Your job listing has ticked all the boxes with the reader up until this point, except one final (and important) section – and this section is all about your company’s personality and culture. You don’t want to outright tell them what your company’s personality is. The trick is showing it to them with words that reflect your company or department’s culture. For example, you can’t claim to be the most exciting and creative PR agency in the country and have a formal, old-fashioned job listing. The job ad should convey the company culture so that it can be used as a filter once the applications arrive. That way, if you choose, you can filter out the applications that aren’t a good culture fit. All job listings should end with a call to action. What do you want readers to do next? How can they take action? Here’s how to get it right: Don’t just ask for them to send in their resumes. That makes the application process too easy. Instead, include an assignment in your job listing – one that’s easy for the right candidates to understand. For example, if you’re looking to hire a customer service representative, you might ask candidates to make sure their cover letter includes a description of a difficult situation involving a customer and how they would handle it. The qualified candidates will have the experience to share and will be excited to have a chance to stand out from the crowd, while the casual applicants will probably not bother putting in the additional effort required. Flawless grammar, perfect spelling, clear sentences and organized paragraphs? Yes, please! Once you’re comfortable with the full content of your job listing, it’s time to revise it with an emphasis on readability. And after you’re finished proofreading, get a second pair of eyes to go over it, catch the typos that your eyes got used to and to make sure the job listing is clear. Creating a clear and specific job listing will take some of your time and maybe other resources as well, but it’s worth it because people will always be your company’s greatest resource. In doing so, you’ll reduce the number of unqualified candidates and increase your chance of hiring the right team members quickly — all thanks to writing a great job listing! How have your job listings performed? What has worked best for you? We’d love to read your thoughts below.